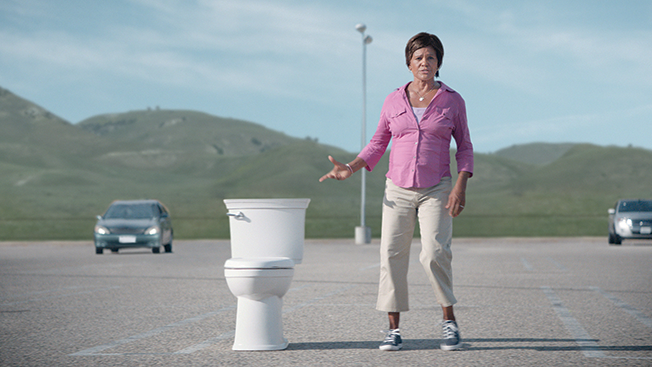 I never really imagined I’d be writing about toilet commercials but when I saw a recent spot for American Standard’s new VorMax flushing system, I just about ____ my pants. Well, not really. But the commercial called “Splatter” certainly made its point and grabbed my attention, particularly since I just recently got over a stomach virus. Actually, the premise behind the commercial makes brilliant sense. Ever since low flow regulations reduced the amount of water toilets could flush from 3.5 gallons down to 1.6, Americans have been both disgusted and discouraged by what’s been left behind. The new VorMax flushing system comes in with two streams of water to wash our troubles away. But how to demonstrate that fact? Resort to potty humor. The first time I saw “Splatter”, I even noticed the subtle reference of a ketchup bottle on the insides of the toilet, cleansed away in a VorMax product demonstration. Now that I’ve seen all three of the commercials (here’s the third one called “Skid Marks” http://bcove.me/b6enm8ex) I see how they’re carrying that message through in each of the spots. So congrats to the creative team at 22squared. We’re not quite ready to rush out and buy a new toilet as a result of this campaign. But they’ve definitely raised brand awareness of American Standard in my brain. There’s a lot of bad advertising out there. Most of it, should be flushed right down the toilet. Thanks to VorMax, I can be sure there won’t be any lingering residue. During the day, there’s no doubt what my profession is – I’m a writer and a creative strategist, helping companies with their marketing communications challenges. I don’t just enjoy what I do, I love what I do. I get as energized now about coming up with strong concepts as the day I first entered the business which, when you think about it, was truly from another era – when copywriters created their copy on manual typewriters. No, it wasn’t the Golden Age of Advertising – that was supposed to have been in the ’60s. But it was long before the internet came along, before cell phones and fax machines and the whole concept of a blog would have sounded like some sort of science fiction term. Recently, the brush is winning out over the keyboard keys. So the blog is losing momentum, losing readers and I am losing interest – to a degree. I don’t believe I’ve gotten any business as a direct result of the content I push out. I know I’m not following all the rules of blogdom and that if I really wanted to become a Subject Matter Expert in the wonderful world of advertising and marketing communications, I’d have to always be on point and actually push out some knowledge that could be of use to people. There are plenty of people that do that already. So instead, I write about what interests me – and apparently, I’ve written about enough things that interests others from time to time. Since I began this blog, I’ve gotten more than 50,000 views – which initially sounds impressive. But in reality, that’s not even equal to the attendance of a bad Rams home game (not that I can write about them anymore). And when you spread those 50,000 views out over a 5-year period, the numbers begin to get smaller and smaller. Meanwhile, my painting prowess seems to be picking up a bit more. I had a 16-year hiatus from the canvas but now, I love to have a painting in the works. I was proud to have my work on display at the MySLArt.org first ever “Best of Showcase”. There were some very cool paintings on display and I think my work stood on its own. Recently, I began sharing some of my paintings on a new app called ArtLoupe, put out by Art St. Louis and I was flattered yesterday to receive a message that I’ve been chosen as one of 12 artists that they will be promoting through the organization’s various social media accounts which includes over 6,000 followers. My hope for 2016 is to land a gallery show of my own and I’m going to be pursuing that over the coming months. It’s cool when other people post your work. It’s fun when other people read your work. Bottom line, I’m going to try and do both. But right now, there’s a canvas that is calling my name.